Ingredients: Talc, Glyceryl Ethylhexanoate/Stearate/Adipate, Nylon-12, Lauroyl Lysine, Cetearyl Ethylhexanoate, Octyldodecyl Stearoyl Stearate, Dimethicone, Isopropyl Myristate, Polyacrylamide, Sorbitan Stearate, Zea Mays (Corn) Starch, C13-14 Isoparaffin, Silica, Magnesium Aluminum Silicate, Laureth-7, Imidazolidinyl Urea, Sodium Dehydroacetate, Methylparaben, Ethylparaben, Propylparaben, Butylparaben. +/-May Contain: Mica (CI 77019), Titanium Dioxide (CI 77891), Iron Oxides (CI 77491, CI 77492, CI 77499), Red 7 (CI 15850), Ultramarines (CI 77007), Yellow 6 Lake (CI 15985), Yellow 5 Lake (CI 19140). I had this blush on my wish list ever since I saw it lovely reviews online. 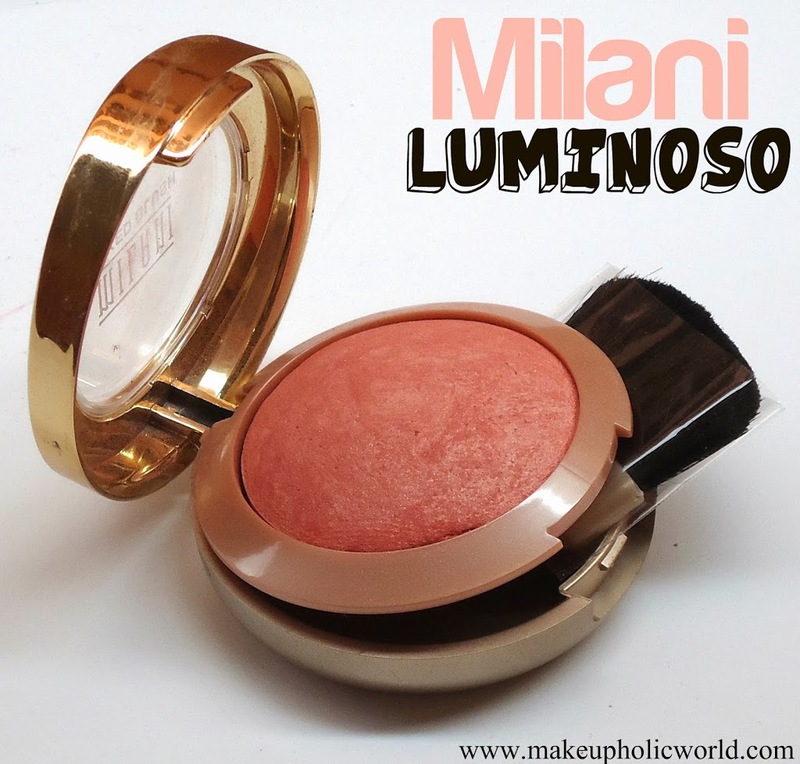 It’s very difficult to find even a single review by any blogger who doesn’t praise these blushes and especially ‘Luminoso’ from the brand-Milani. The 8 blushes in the baked blushes category from the brand are all beautiful in shade, texture and pigmentation. Even the price is quite good but we do have to pay extra for shipping as these are not available in India. Shade: ‘Luminoso’ is a flirty, peachy coral shade that just makes your cheeks come alive. It is simply fabulous as it just provide a healthy glow without it being too much. There is a slight amount of silvery veins in the baked Luminoso dome which adds a sheer glow to the skin without any visible sparkle/shimmer. So it can be used anytime whenever you wish to add a luminous look to your skin. The shade is definitely universally flattering on all skin tones. Texture: The blush is soft, smooth and easy to blend. It is quite pigmented so a single time application is enough to add a light sheen to your face. One can easily build up the pigmentation if need arises. Longevity: The blush gives a good staying power of 6 hours on me with little fading. It fades away evenly or can be removed easily using any cleanser. Packaging: The blush comes in a sturdy thick plastic case with a transparent lid. The pack comes with a mirror and a flat soft brush that comes handy at situations. Overall the packaging looks nice and good. · Adds a healthy luminous glow along with the color. Final Word:If you want a close dupe of Nars blush without the shimmer then you must try this. It is an affordable blush that can suit every skin tone perfectly. Wow nice warm shade. Looking like a natural glow on the cheeks!